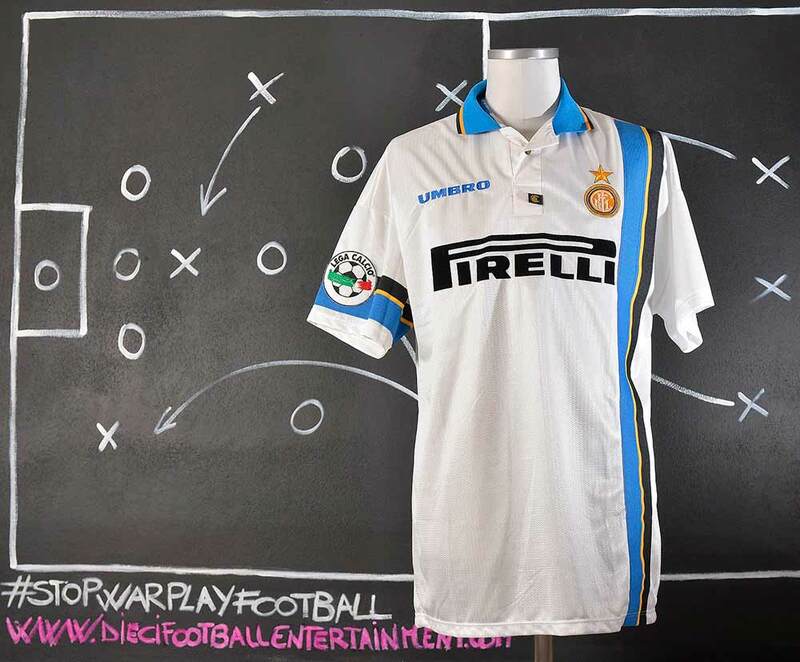 During the game vs Guingamp of the Uefa Cup 1996/1997 the team played with regular Serie A shirts. The main difference between Serie A and Uefa Cup games is that on Uefa Cup games the sponsor logo is forbidden on retro number. 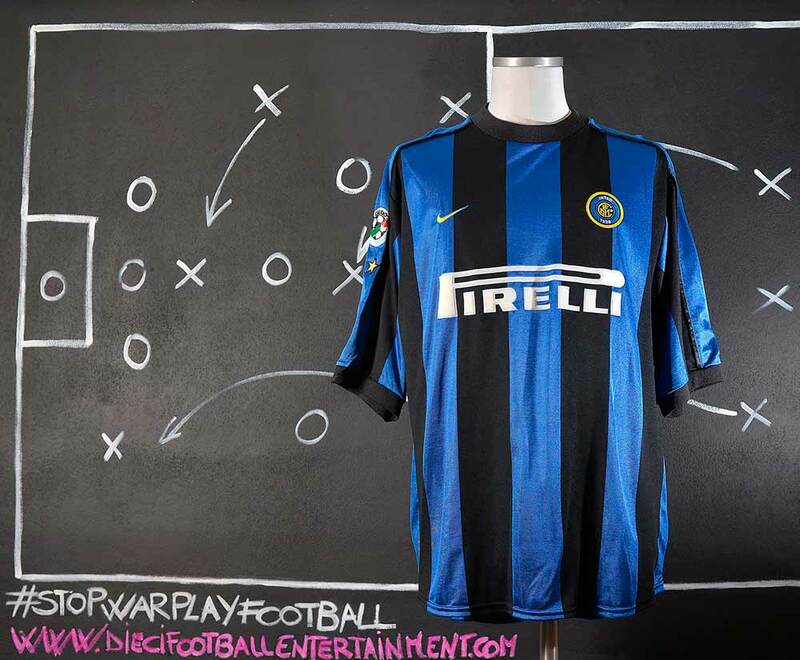 So before the game vs Guingamp the Internazionale F.C. kitman cover the Umbro logo on the number with a black marker. 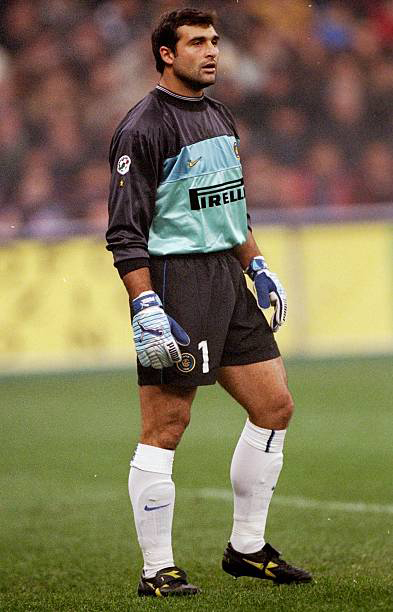 In 1994, Pagliuca moved from Sampdoria to Internazionale from a then world record fee for a goalkeeper of £7 million. 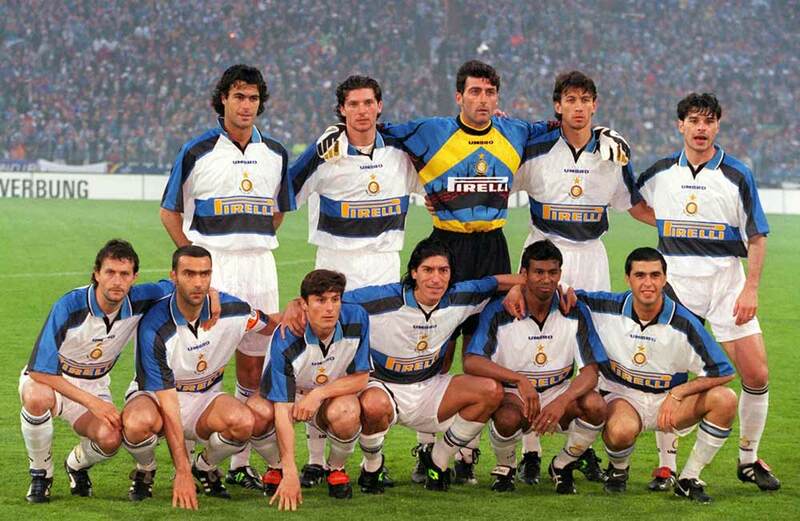 With the nerazzurri he reached two consecutive UEFA Cup finals, losing the first one against Schalke 04 in 1997 and winning the second one in 1998, when he captained the side to a 3–0 win over Lazio. 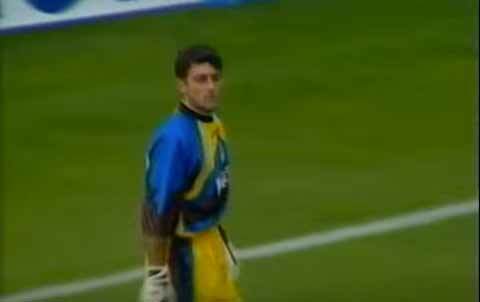 Pagliuca left Inter in 1999, moving to his home town club, Bologna, after the former Juventus boss Marcello Lippi took charge of Inter and signed Angelo Peruzzi from his former club. 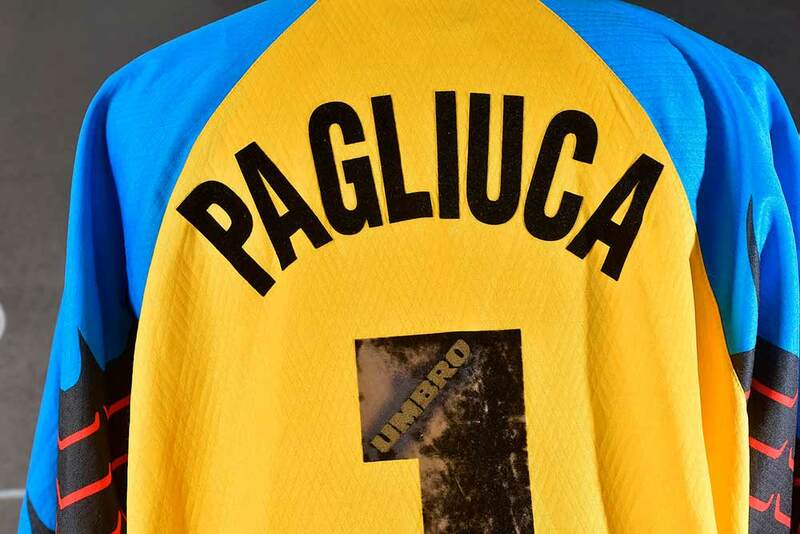 This shirt was worn by Gianluca Pagliuca during the game against Guingamp for the Uefa Cup 1996/1997. It was given to the old Guingamp stadium’s custodian who sold it in a charity auction. 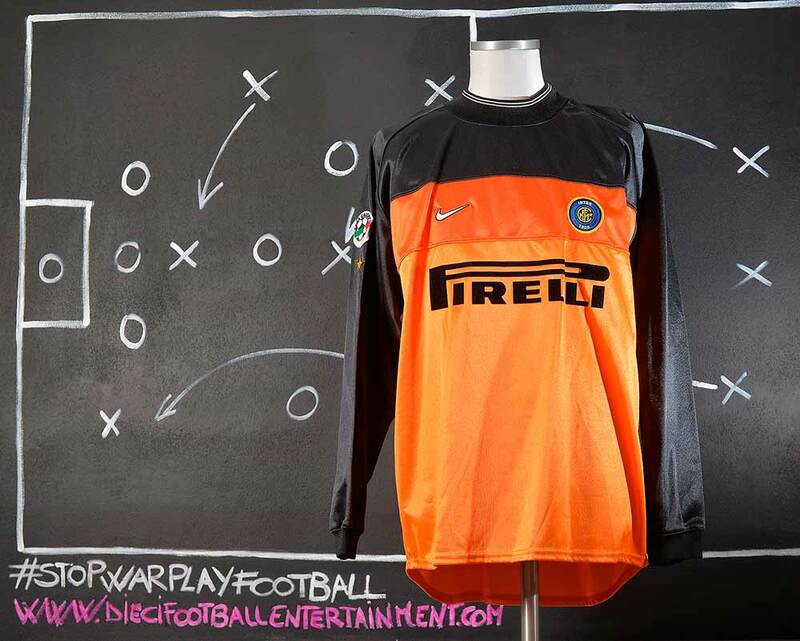 This shirt, was used by Ronaldo during Bologna-Internazionale which took place in Bologna on Sept.13th 1997. 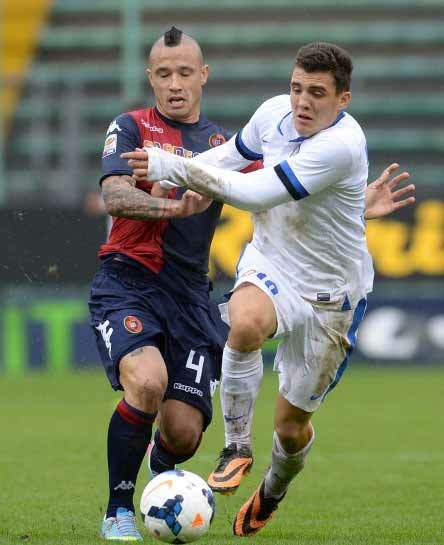 The shirt was swapped after the match with Michele Paramatti, Bologna former player. 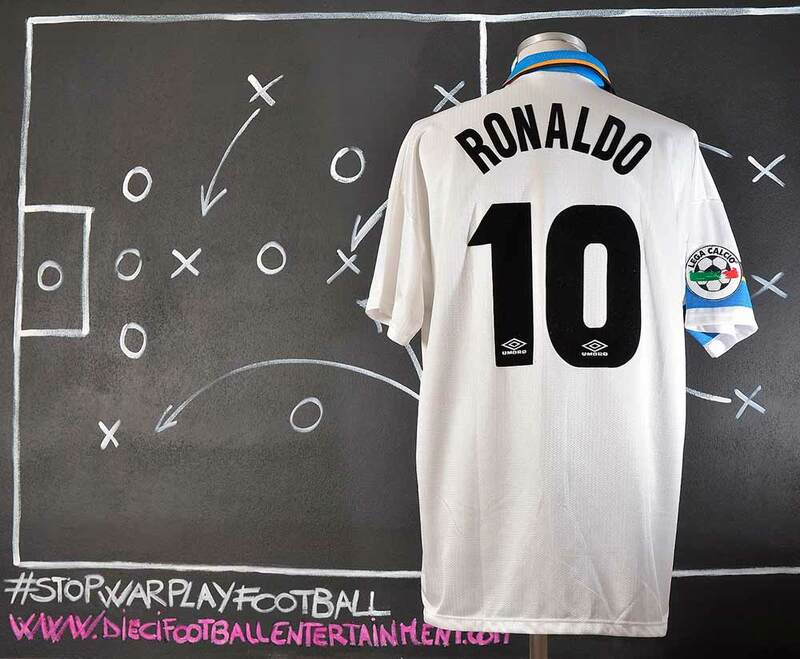 It was auctioned by Paramatti in 2012 for the charity event “Una Maglia per l’Emilia” organized by the player to raise money for people of Emilia Romagna (Italy) who got invloved in the tremendous earthquake of 2012. 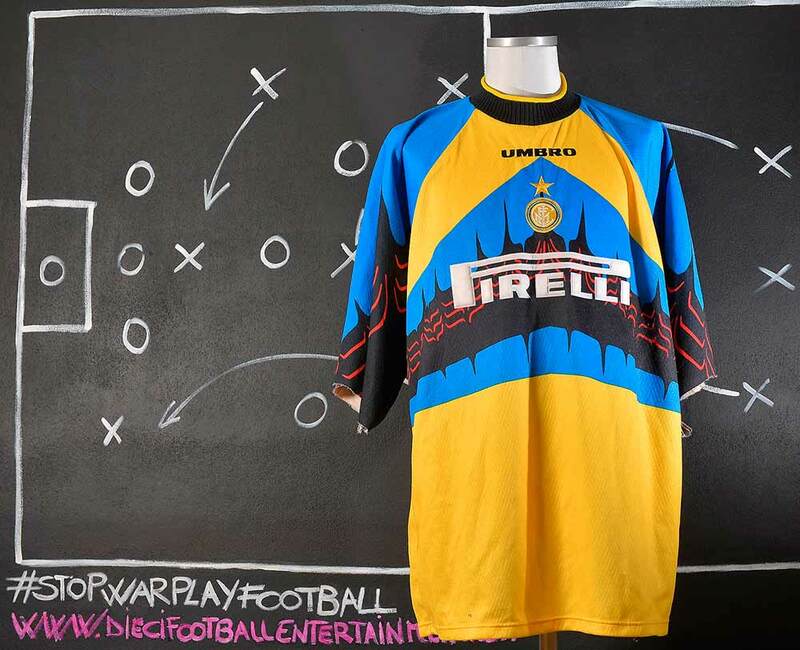 Bologna-Internazionale was played in Bologna on September 13th 1997. 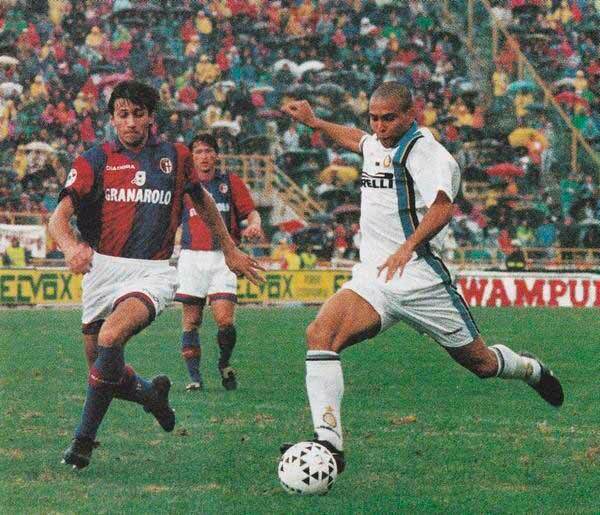 It was the second game of the Serie A 1997-1998 and it is the game of Ronaldo’s first goal in Serie A.
Miami, 2015. A whole family came into a restaurant and they started having their meals. The young son Jeremia after he looked around at the restaurant’s guests shaked his father’s arm saying “Hey Dad look at there. Pepe from Real Madrid is seating there”. 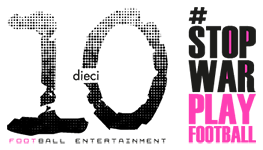 “Jeremia – the father said – be good and don’t bother other table’s guests”. But jeremia was so excited and kidnapped Pepe’s attention who suddenly stood up and went to Jeremia’s table saying “Sorry for bothering you but I’m one of your biggest fans” and he wanted to take pictures with the kid and his father. Jeremia got surprised especially when he reminded that the same thing happened with Luis Suarez who wanted to take pictures with his father. He knew his father was a soccer player and he knew some stories about him but he never really believed in them. Until Suarez and Pepe made Jeremia changing his mind. 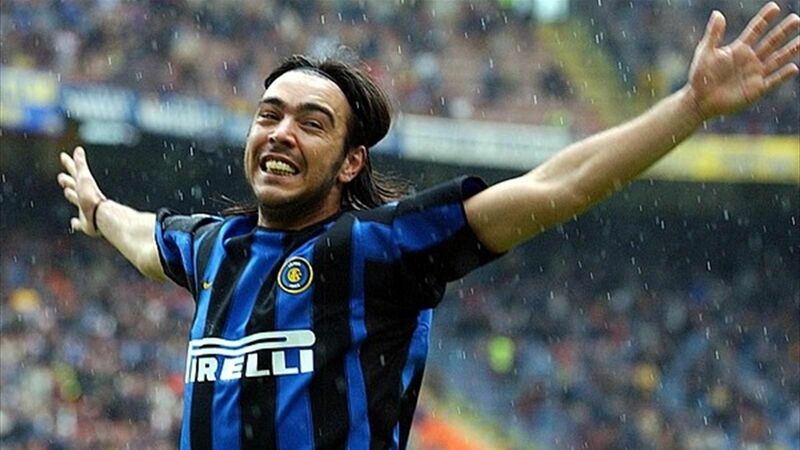 Jeremia father’s name is Alvaro “El Chino” Recoba. 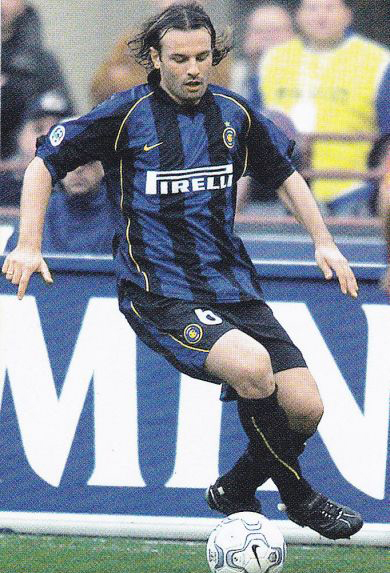 At the beginning of the 1999–2000 Serie A season, Di Biagio transferred to Internazionale, and became a regular first team member due to his continued high standard of performance. During the 2001–02 season, he narrowly missed out on winning the Serie A title to Juventus on the final match-day; he received criticism, however, for his despondent performance in a 4–2 defeat to Lazio at the Stadio Olimpico in Rome, on his final league appearance of the season, despite initially scoring a goal during the match. 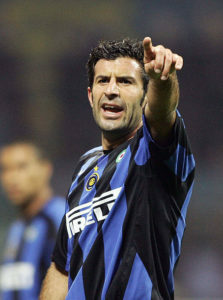 Di Biagio remained at Inter until 2003, and during his four years at the club, he amassed 163 appearances, scoring a total of 18 goals in all competitions. 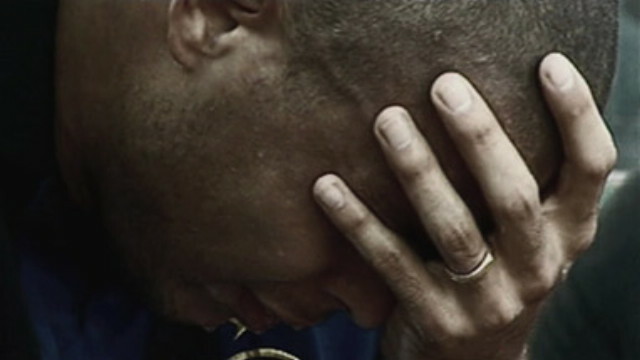 Although he was unable to win a title during his time with the club, he did manage to reach the semi-finals of the 2001–02 UEFA Cup with Inter, losing out to eventual Champions Feyenoord. He also reached the semi-finals of the 2002–03 Champions League with Inter, under manager Hector Cuper, losing out to cross-city rivals and eventual Champions Milan on away goals. 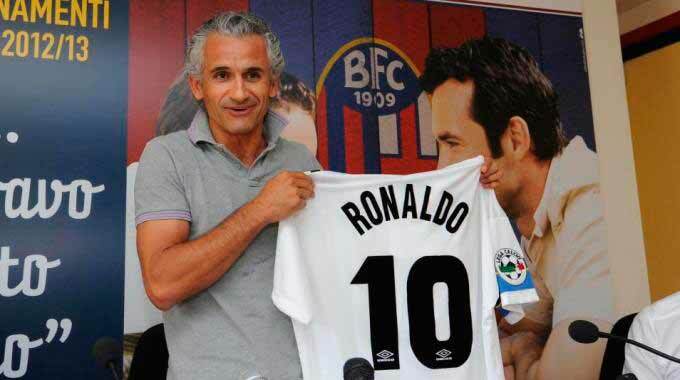 He also managed to win runners up medals in Serie A during the 2002–03 season under Cuper, as well as in the Coppa Italia during the 1999–2000 season, and the Italian Supercup in 2000, under Marcello Lippi. In the 1999–2000 season, Baggio’s former Juventus manager, Lippi, was appointed as Inter’s new coach. Lippi did not favour Baggio, and left him out of the squad for most of the season, stating that Baggio was out of shape. In his autobiography, Baggio stated that Lippi had dumped him after Baggio refused to point out which of Inter’s players had expressed negative opinions about the coach, also highlighting an incident during a training session, where he called out Christian Vieri and Christian Panucci for applauding Baggio for a notable assist. Baggio was used scarcely, and often as a substitute, scoring only 4 goals in 18 appearances during the regular Serie A season. 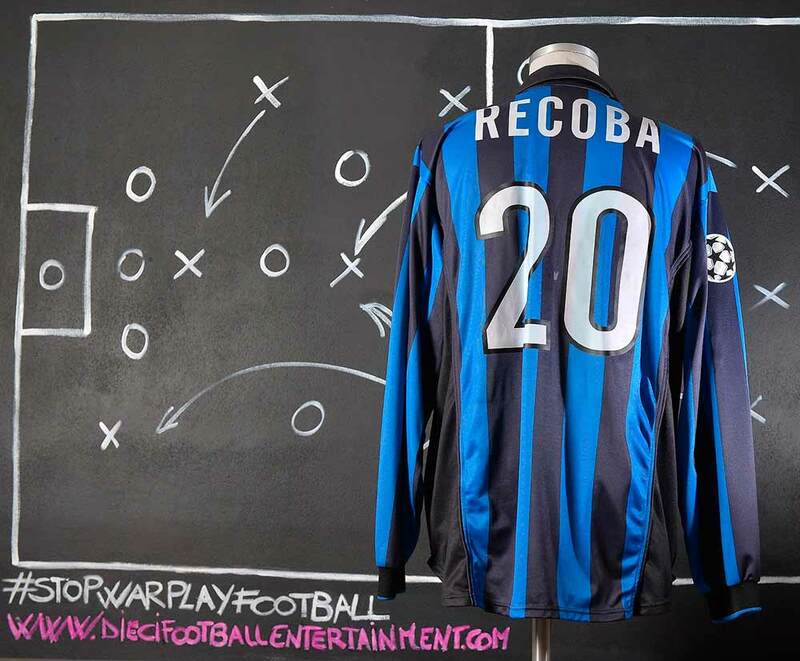 He made 5 appearances in the Coppa Italia, with his only goal coming against local rivals Milan in the second leg of the quarter-finals, as he helped Inter reach the final, only to be defeated by Lazio. 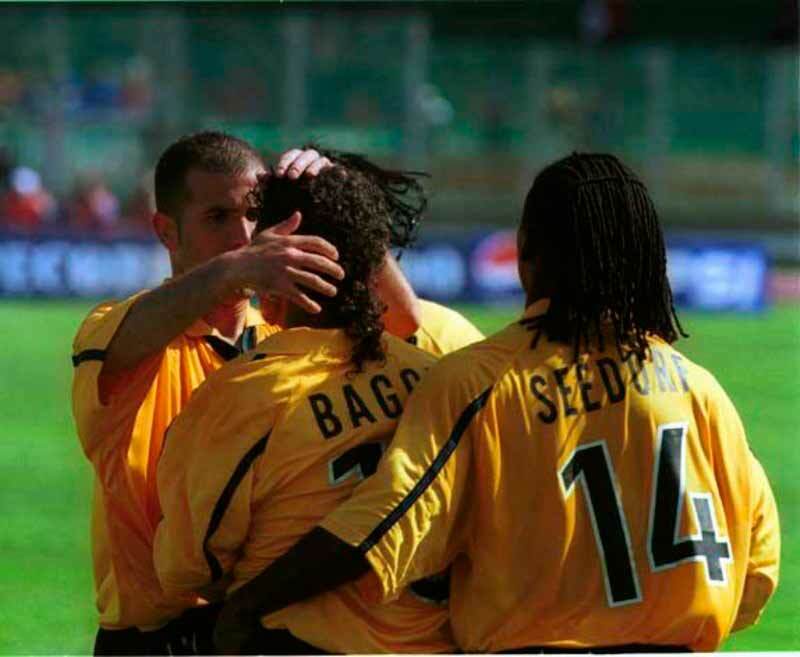 Despite his limited playing time, Baggio still managed several important goals to help Inter to a fourth-place finish, alongside Parma, such as his match winning goal against Verona, which he scored after coming off the bench, after being excluded from the team since 18 December 1999. Baggio had also previously helped to set up Inter’s equaliser during the match. This was the first time Baggio had scored for Inter since his goal on 27 May of the previous season, and in the post-match the interview, he denied accusations made by Lippi in regard to his personal form. 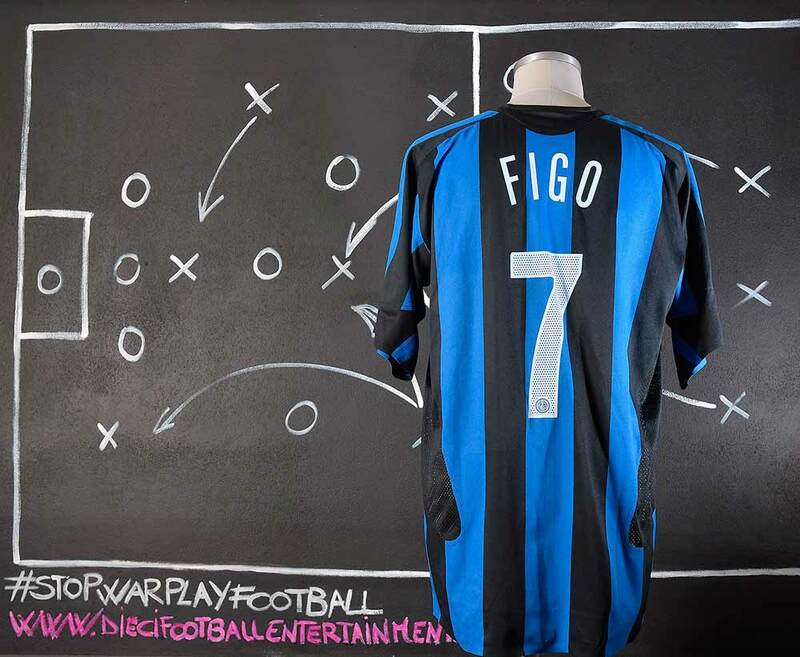 Baggio’s last important contribution to Inter was scoring two memorable goals against Parma in the play-off match for the last remaining UEFA Champions League place, which Inter won 3–1; Lippi had been forced to field Baggio due to several injuries. 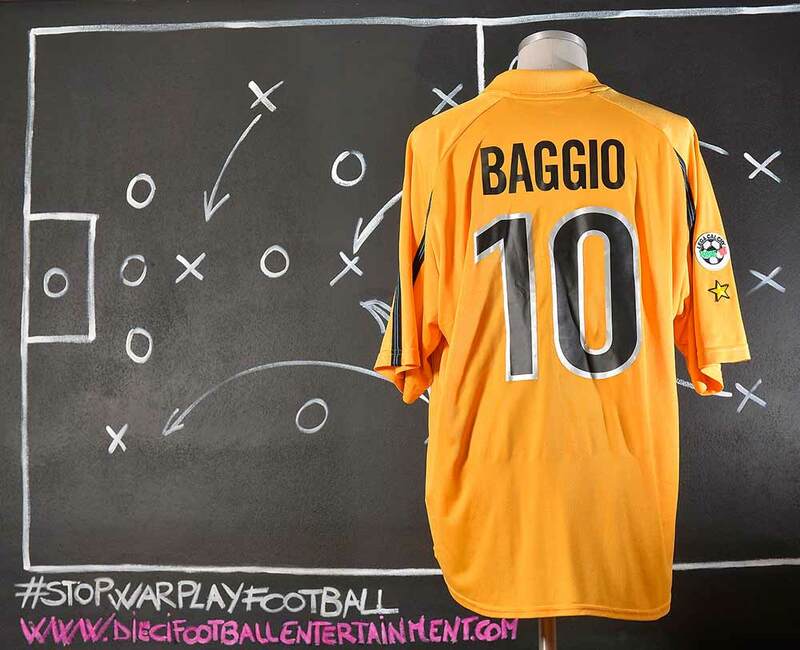 Baggio was given a perfect 10 rating from the Italian sports newspaper La Gazzetta dello Sport, who described his performance as “absolutely perfect all game”. 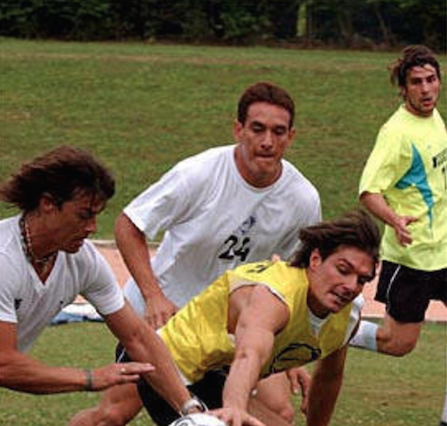 This game is considered an example of professionalism shown by Baggio, as Inter’s president Massimo Moratti had stated that Lippi would only stay on if the team qualified for the Champions League. 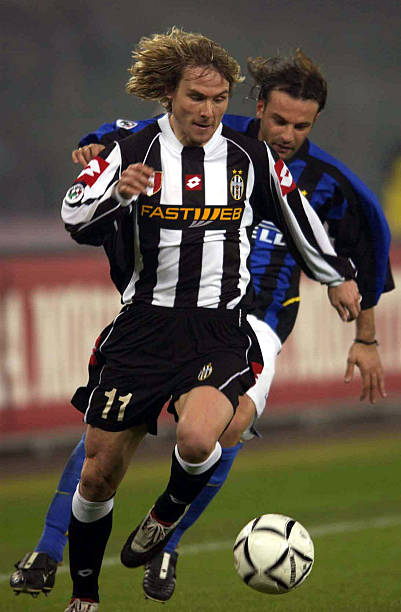 After leaving Juventus in 1999 for 28 billion lire (€14.461 million) transfer fee and a reported 8 billion lire pre-tax wage, Peruzzi spent one unsuccessful season with Internazionale – despite his excellent performances –, under his former Juventus manager Marcello Lippi, finishing the league season in fourth place, and reaching the Coppa Italia final. 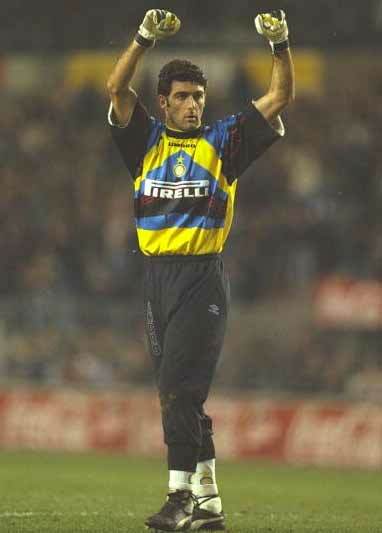 Vieri was a complete, quick, prolific and opportunistic striker, with a keen eye for goal. Due to his notable goal-scoring prowess, Vieri is regarded by pundits as one of the greatest Italian strikers of all time and one of the top strikers of his generation. In his prime, his unique and direct offensive style of play, which blended power with pace and a solid technique, led him to be compared to Luigi Riva and Roberto Boninsegna, as well as earning him the nickname of “Il Toro” (“The Bull”). Despite his goalscoring ability, he was also injury prone throughout his career, however, which greatly affected his pace, fitness and mobility in later years. 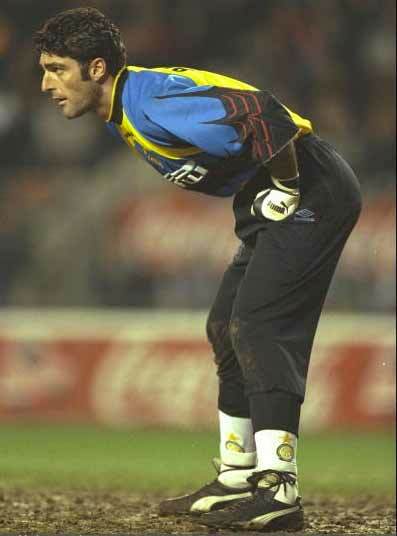 Vieri was predominantly left-footed, although he was capable of scoring with both feet, as well as with his head, and from volleys. 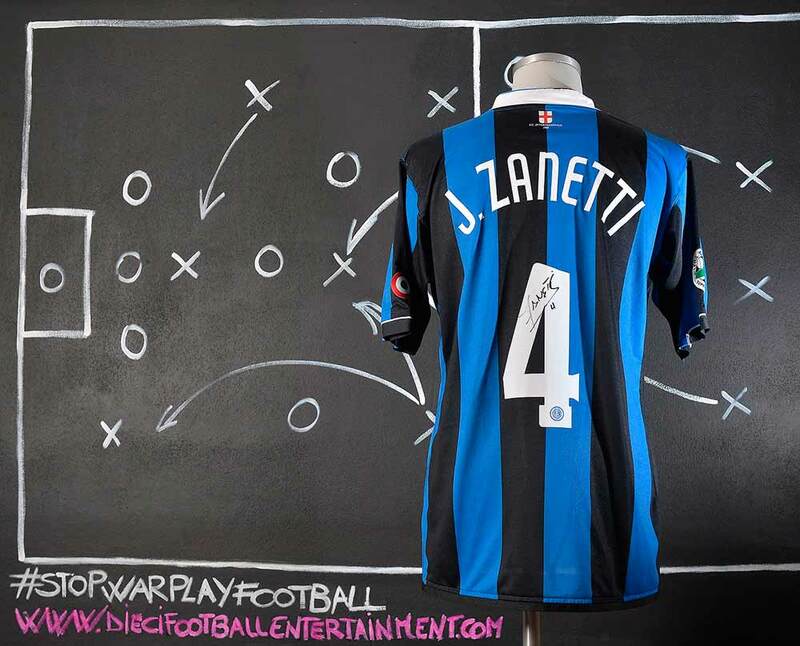 He has often been described as a large, old fashioned centre forward, due to his powerful physical presence and outstanding aerial ability; he is the all-time top scorer of headed goals in Italian league history. Despite being primarily a goal-scoring striker, he was also capable of providing assists to teammates, which was aided by his ability to use his strength to hold up the ball and play with his back to goal in order to participate in the build-up of attacking plays. Although he was primarily a goal-area threat, Vieri had an accurate and powerful shot from distance as well as inside the area; he was also an accurate penalty taker. At Inter, Vieri formed a potentially dangerous partnership with Ronaldo up front, but because of injuries to both players, they were not able to play together often. He was impressive in his first couple of seasons, but constant managerial changes meant that Inter could not challenge for the Scudetto. 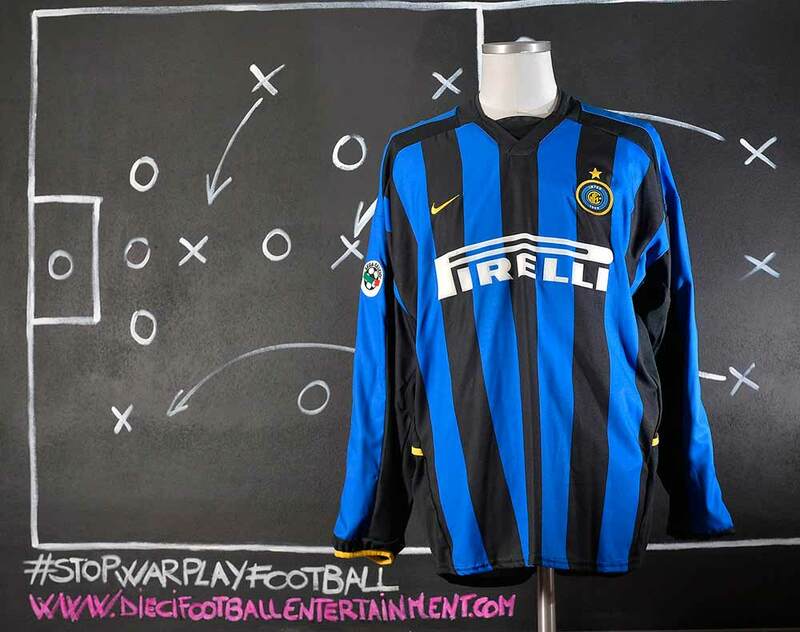 It was under disciplined Argentinian coach Héctor Cúper, that Vieri and Inter really began to flourish and challenge for honours. 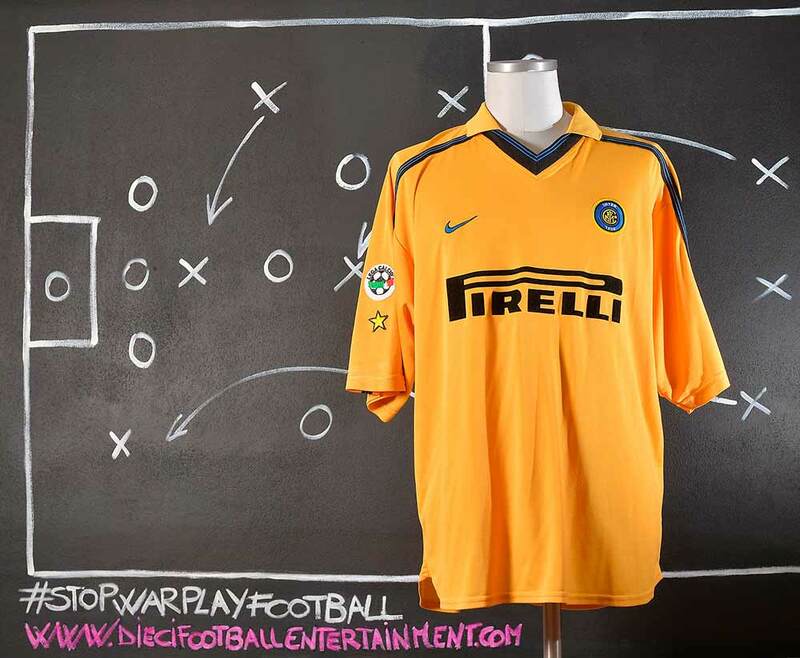 Vieri was made the focal point of the attack and scored 22 goals in 25 games in the 2001–02 season as Inter narrowly missed out on the title after their last-day defeat to Lazio. 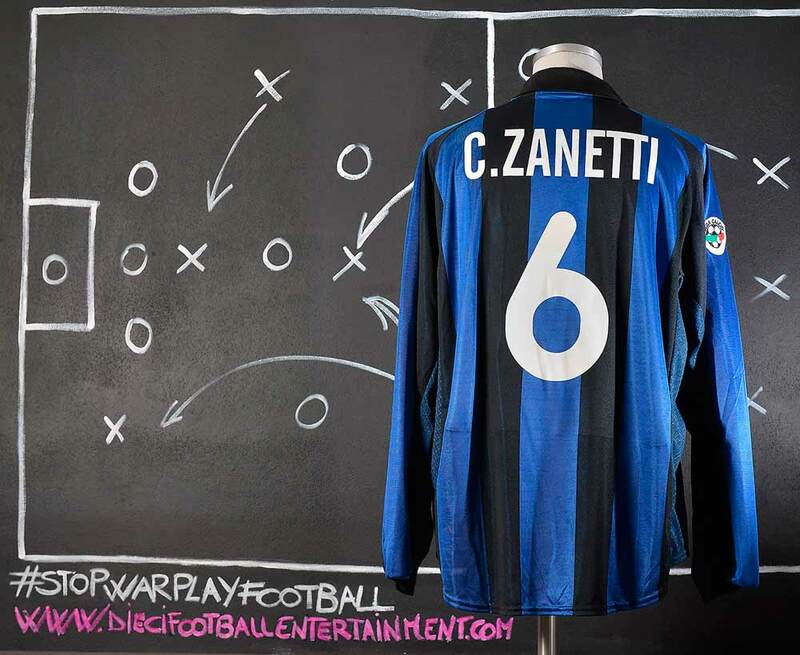 In June 2001, Zanetti re-joined Internazionale under manager Hector Cuper; Inter paid 10 billion Italian lire to buy back Zanetti. He was a regular starter under Cuper, and with the club he managed to the reach of the semi-finals of the 2001–02 UEFA Cup and the 2002–03 UEFA Champions League, also narrowly missing out on the Serie A title both of those seasons. The 2003–04 season was more disappointing, however, and upon the arrival of new manager Roberto Mancini, he was deployed with less frequency due to injuries, as well as the arrivals of Edgar Davids and Esteban Cambiasso in midfield, although he was finally able to capture some silverware during his final two seasons at the club. 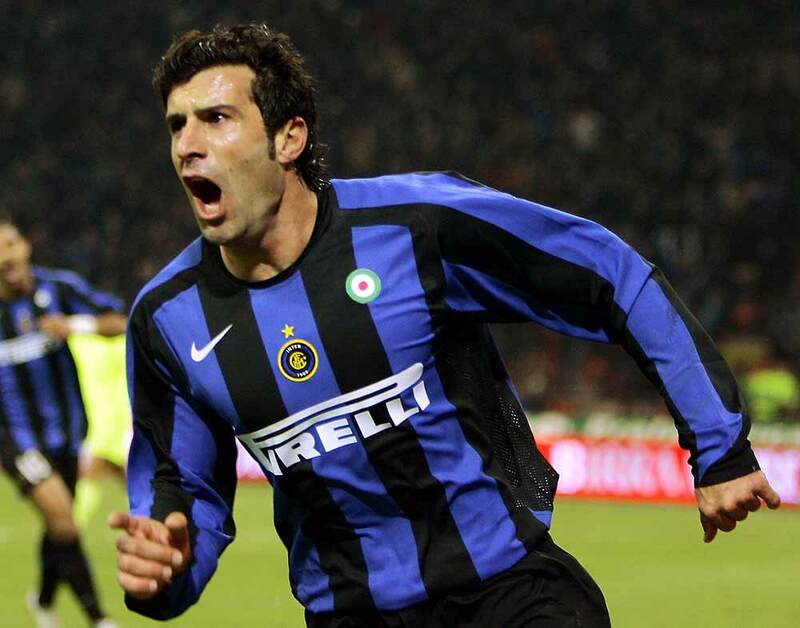 During his second stint with Inter, he won two Coppa Italia trophies in 2005 and 2006, a Supercoppa Italiana in 2005, and he was also awarded a Serie A title after the Calciopoli scandal in 2006. Toward the beginning of the 2001–02 season, Héctor Cúper was appointed new coach. 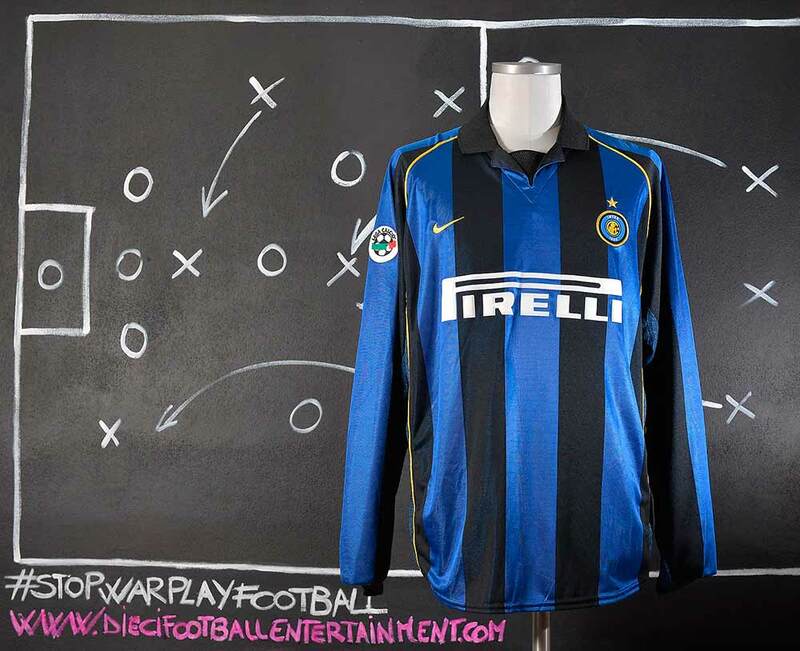 Inter started well in Serie A, winning four times in five games. However, they did not manage to lead in January: A goalless draw against Lazio, in matchday 17, resulted in second place. 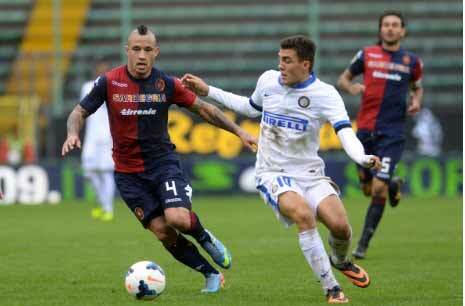 During the return half, Inter collected 27 points in 11 matches before losing to Atalanta in early April. The side did not lose top position, but Juventus and Roma filled part of gap. 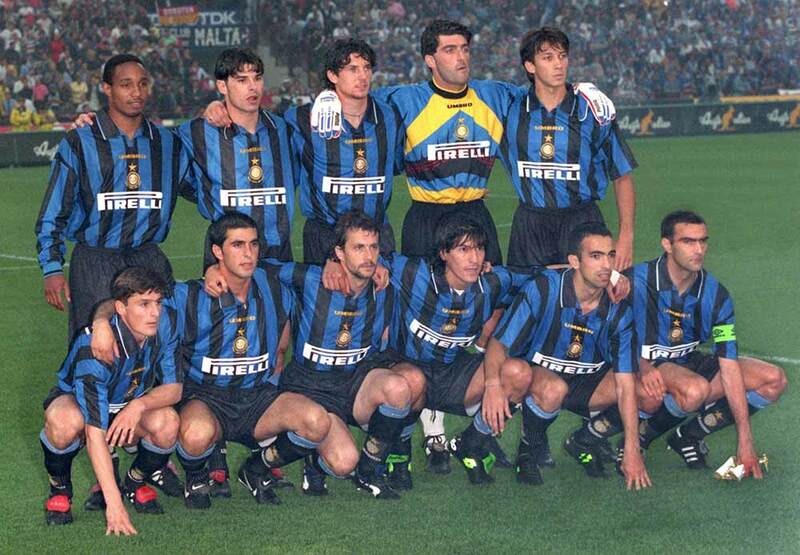 Inter also suffered a disappointment in UEFA Cup, being knocked out by Feyenoord. The last matchday resulted deadly for title hopes: Inter faced off with Lazio, who still had some chances for a European spot. 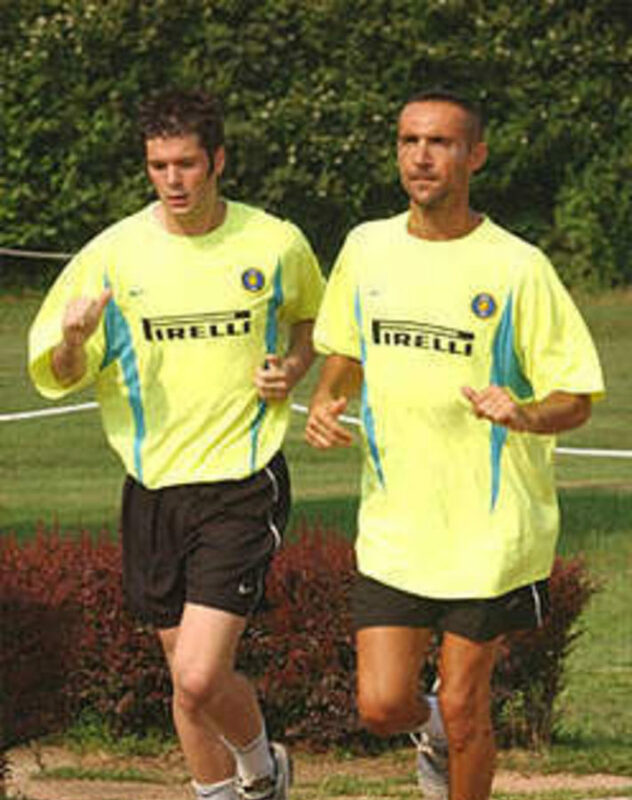 In the first half of the match, Karel Poborský equalized Christian Vieri and Luigi Di Biagio’s goals. During the second half, Diego Simeone and Simone Inzaghi scored to give Lazio a 4–2 win. 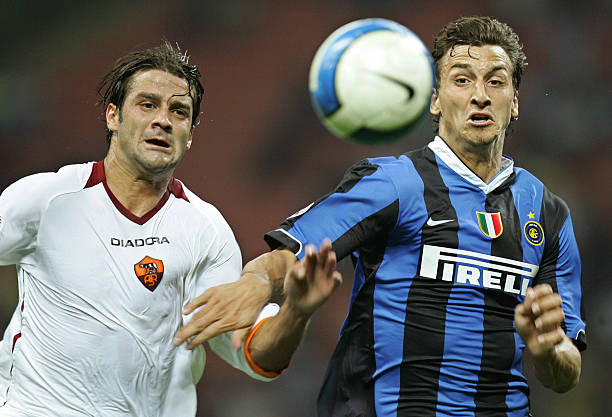 As both Juventus and Roma won their games, Inter fell to third place, just reaching a Champions League’s play-off. Ronaldo’s desperation for the missed Scudetto. 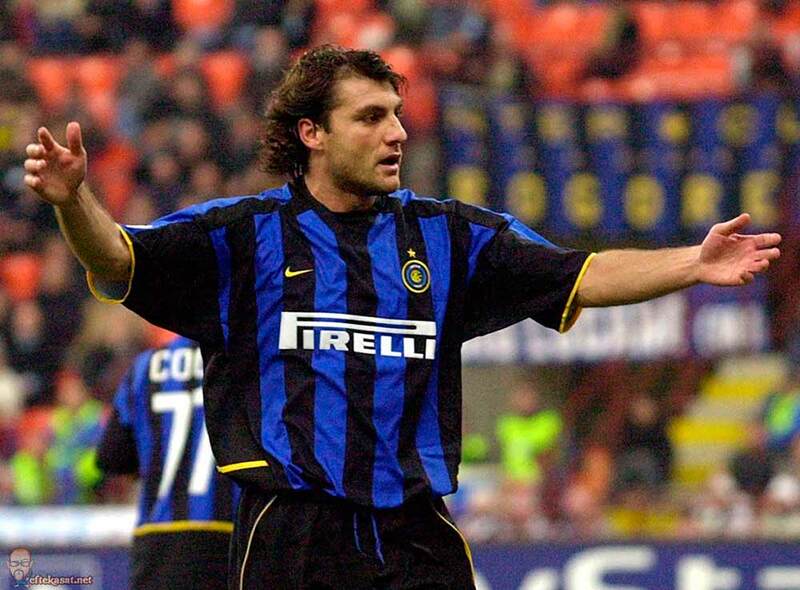 In the 2002-2003 season Vieri was Serie A Capocannoniere after scoring 24 goals in 23 appearances. In addition, he scored three goals in Inter’s Champions League campaign and formed a potent partnership with Hernán Crespo. He scored both of Inter’s goals in the quarter-final victory over Valencia. 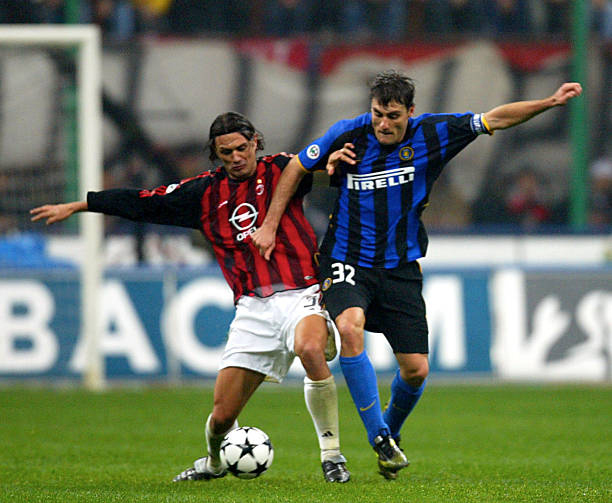 Vieri was injured during the second leg of this game and therefore played no part in the semi-final defeat to city rivals Milan. The start of the season was marked by the departure of Ronaldo and the arrival of Hernán Crespo after club had already acquired Fabio Cannavaro, Matias Almeyda and Domenico Morfeo. 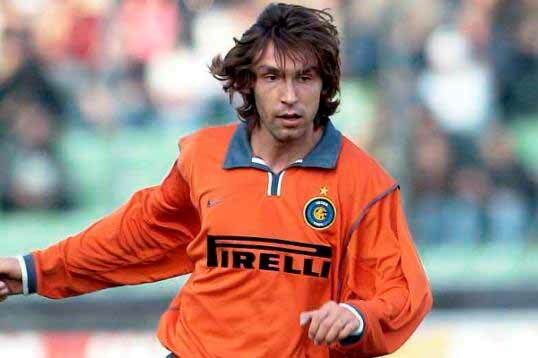 Crespo, along with Vieri, built an attacking duo. Crespo was essential in the 2002–03 UEFA Champions League while Vieri usually scored in the domestic matches. Their partnership worked until Crespo sustained an injury, which sidelined him for several weeks. 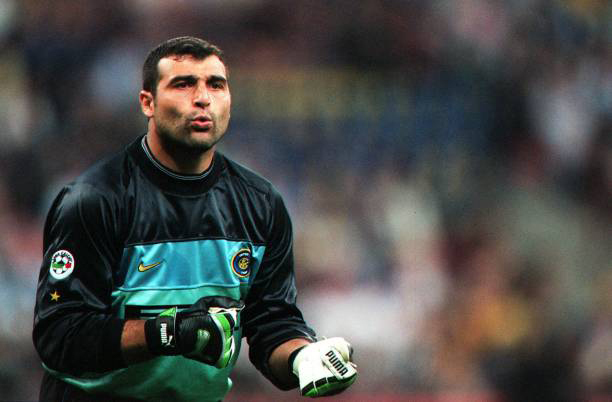 Without him, despite replaced by Batistuta, Inter lost some key matches. One of these was against Juventus who, could finally aim for the title. Inter managed to get to the Champions League quarter-finals, after passing in second in the group phase. Inter’s opponent was Valencia, winning 1–0 at home. A 2–1 defeat in Spain had no effect on qualification, due to the away goals rule. As Crespo came back from injury, Vieri got injured, but he managed to retain the title of the league’s top scorer, with 24 goals. 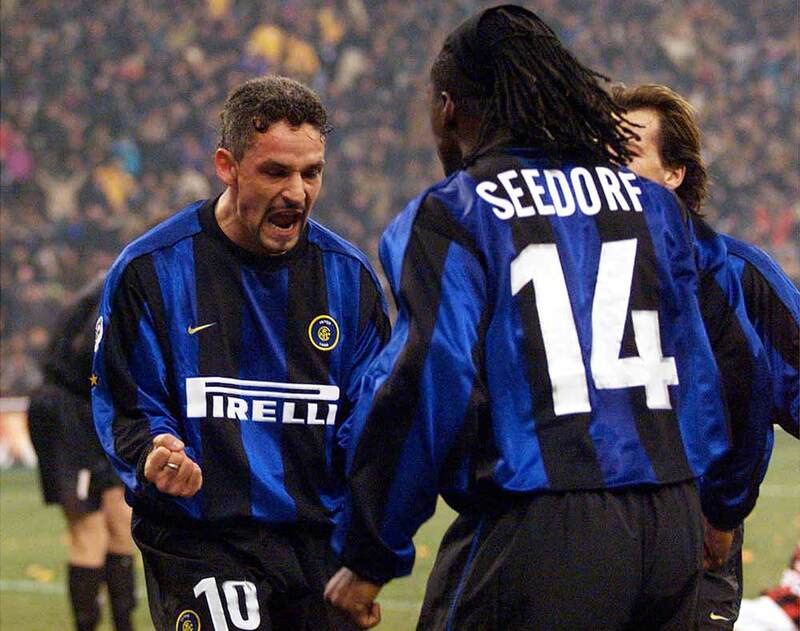 In the semifinals, Inter lost to Milan due to Shevchenko’s away goal in the second leg, equalized by Martins, for a 1–1 aggregate that sent Milan to the final on away goals. Focused on the European competition, Inter collected two draws in the league that stuck them behind Juventus who won title, the second in row. 2005–06 season opened with the success in Supercoppa Italiana, beating Juventus 1–0 in extra time with a goal scored by Verón. During the Champions League group stage, the side managed to have a line-up of 11 foreign players on the pitch: the only european was Luís Figo, playing the second time. Despite a good first half (also including a 3–2 win in derby, that lacked since 2002) Inter had a second part not so bright. Being knocked out in Champions League by Villareal, the side was hardly attacked by his fans. On the pitch, season finished like the previous with a third league place and the win of Coppa Italia against Roma. 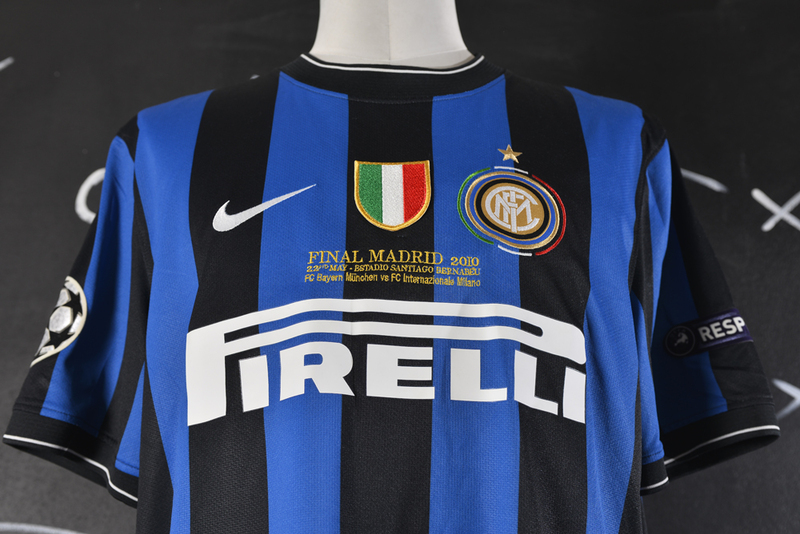 However, during the summer of World Cup, Juventus and Milan resulted caught in Calciopoli scandal: in late July, a few weeks after Italian triumph in Germany, Inter was awarded of 2005–06 title. 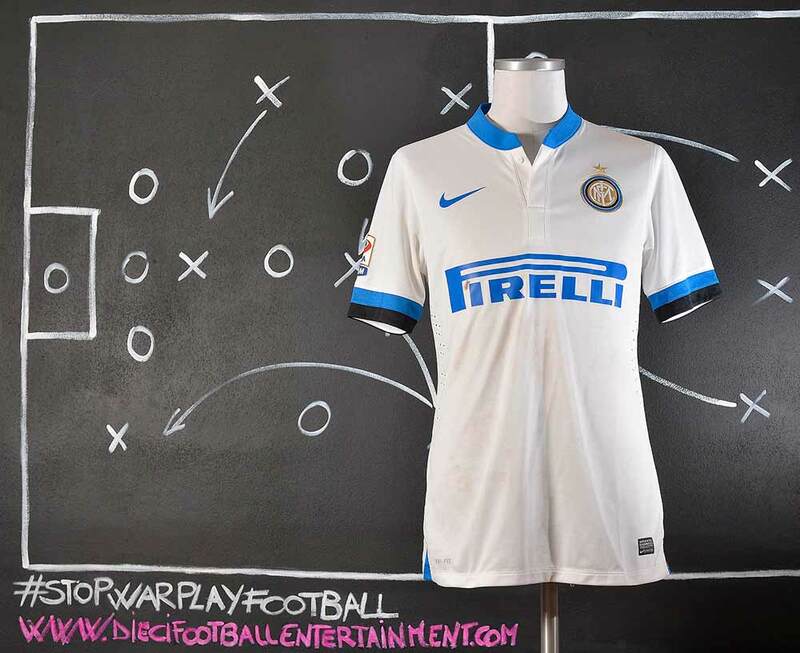 Further, the relegation of Juventus to Serie B made Inter the first and only club ever present in modern Serie A (from 1929–30). The 2006 Supercoppa Italiana was a match contested by the 2005-06 winners Internazionale and the 2005-06 Coppa Italia runners-up Roma. The Coppa Italia runners-up were chosen to play instead of the winners because of the aftermath of the 2006 Serie A match-fixing scandal. 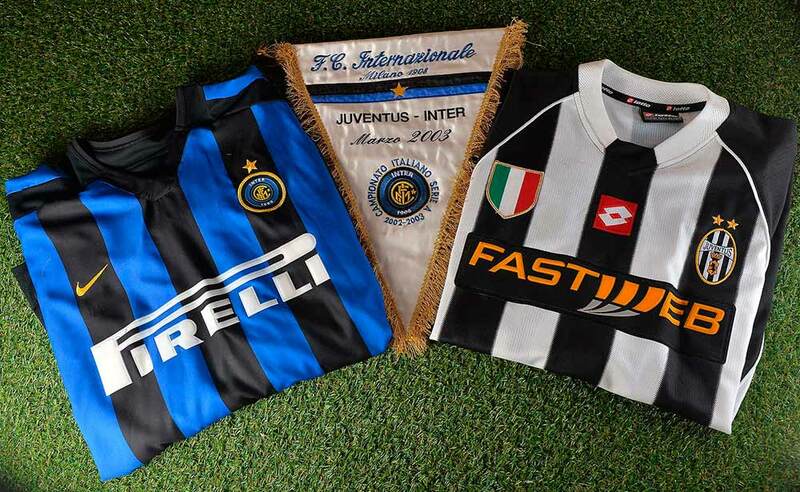 As a result, Juventus, the original league winners, were relegated to Serie B and replaced by Inter as champions. Since the Coppa Italia winners were also the newly appointed league champions, the Super Cup spot was given to the runners-up of the Coppa Italia, Roma. 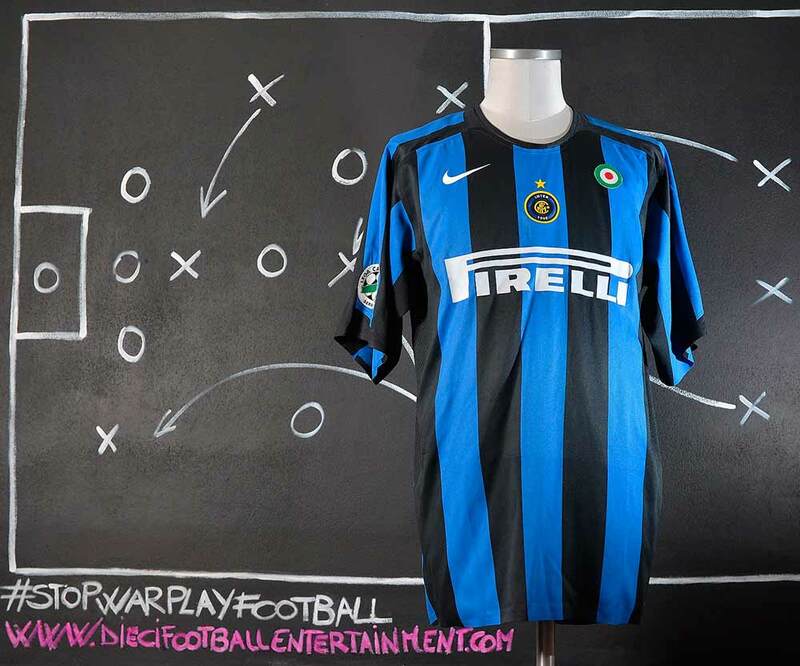 The match resulted in a 4–3 win for Inter after extra time. 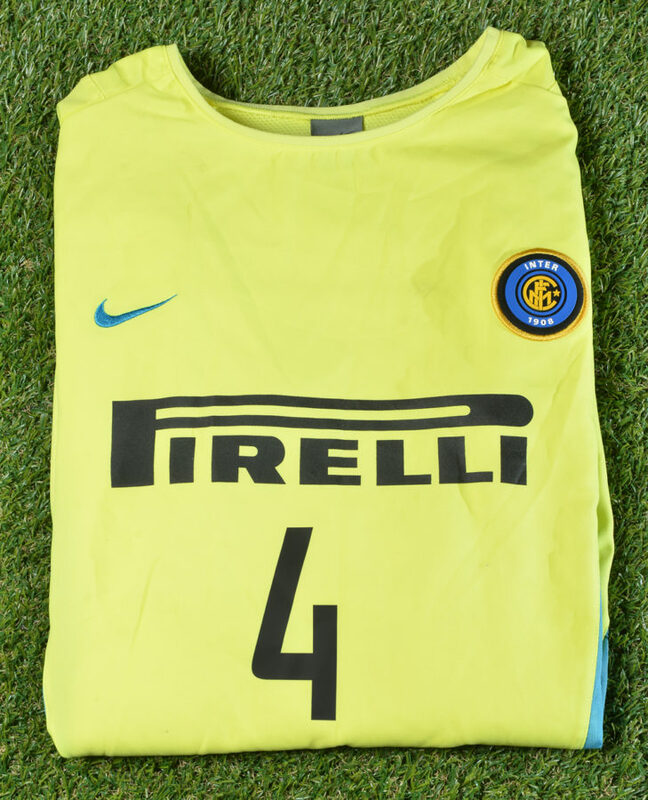 In 2009-2010 Inter had the greatest season in their history completing a historic Treble of Serie A, Coppa Italia and UEFA Champions League, becoming the sixth European club to complete the treble and the only Italian club to achieve this feat to date. Prior to the Champions League Final, Mourinho added two trophies to the season: a Coppa Italia and the second consecutive Scudetto, both won due to Milito’s goals and leaving Roma behind. Milito was also man of the match for Champions League final, scoring both goals in the 2–0 victory whereby Inter defeated Bayern Munich, winning this trophy for the first time since 1965, and for the third overall. Inter became the first Italian club to achieve the Treble. Marko Arnautovic didn’t play the Champions League Final and he was not a reserve of the game either but as all of the other team’s members he got his match issued shirt. 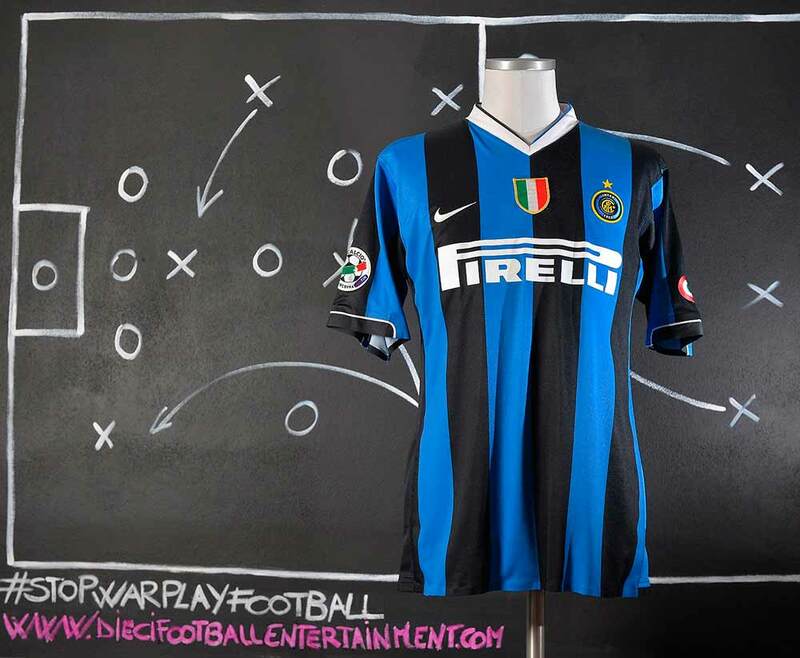 Another curious thing about the Inter’s Final shirts is that the most of the players played the Final with store replica’s shirts and not with regular player’s shirts. Some players played half game with regular player’s shirts and some played the whole game with store’s shirts. 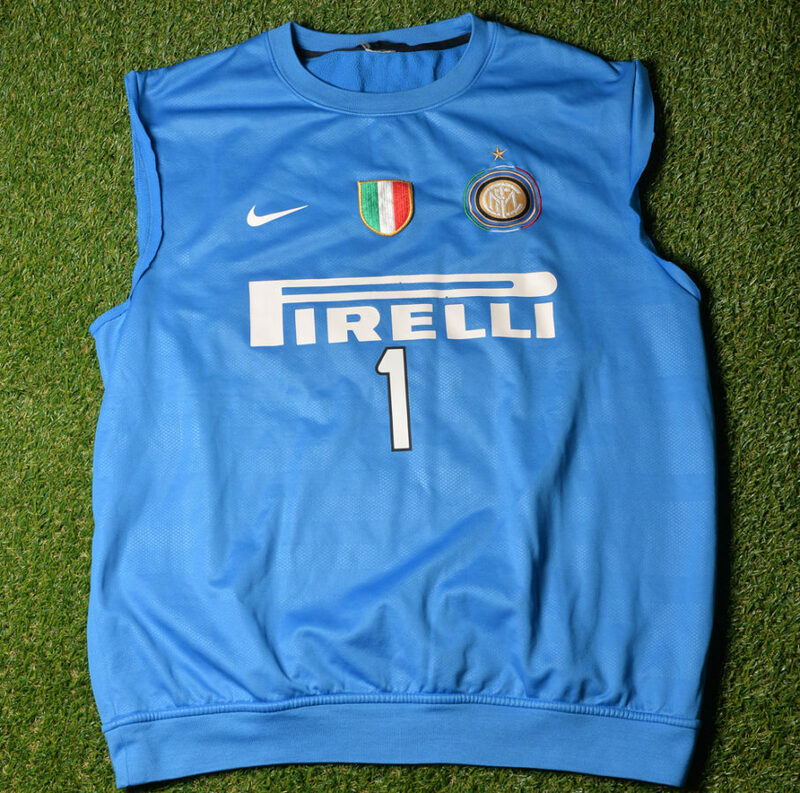 According with inside rumours the team ran out of stock of regular player’s shirts during the season so they have to play with replicas. But….even the team used replica’s shirts there are still some details that make the Champions League Final’s shirts different from fan’s replicas, which is obviously a good thing for shirt’s collectors. The 2010 UEFA Champions League Final was a football match played at the Santiago Bernabéu Stadium, home of Real Madrid, on Saturday, 22 May 2010, to determine the winners of the 2009–10 UEFA Champions League. It was the first Champions League final to be played on a Saturday, rather than the traditional Wednesday. The match was won by Internazionale, who beat Bayern Munich 2–0 to complete the Treble, a feat never before achieved by any team from either Italy or Germany. The refereeing team came from England and was led by Howard Webb. The win gave Inter their third European Cup title, and their first since 1965; moreover, it was their first appearance in the final since 1972, and they were the first Italian team to appear since Milan won the competition in 2007. Meanwhile, Bayern had won the competition as recently as 2001 – their most recent final appearance – although they were the first German side to reach the final since Bayer Leverkusen in 2002. The 2010 final was the first not to feature an English side since Porto beat AS Monaco in 2004, due to Manchester United being knocked out by Bayern Munich in the quarter-finals on away goals. The Santiago Bernabéu Stadium had previously hosted three European Cup finals: in 1957, 1969 and 1980. 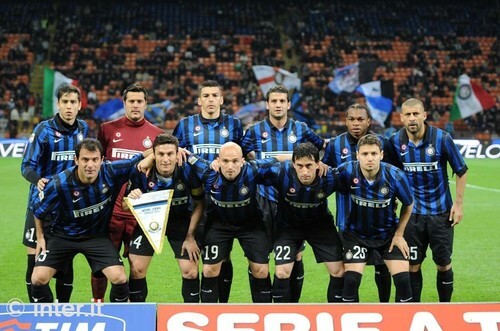 The match was won 2–0 by Internazionale. Inter employed a counter-attacking strategy that saw them have less possession than Bayern, but Inter were able to comfortably defend their lead. Both goals were scored by Diego Milito, in the 35th and 70th minutes. 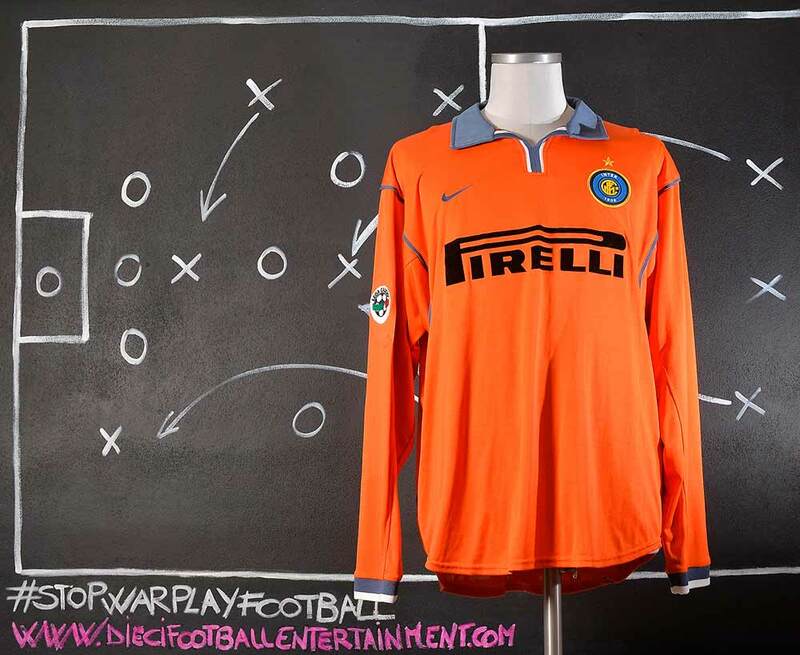 Milito’s first was scored following a long clearance by Inter goalkeeper Júlio César flicked down by Milito to Wesley Sneijder, who returned the pass to Milito to score. Milito’s second goal came after he collected a pass from Samuel Eto’o and beat Daniel Van Buyten with the ball. Milito was substituted shortly before the end of the match, allowing him to be applauded by the Inter supporters. After the match, Milito stated the win brought “incredible happiness” and claimed his side deserved its victory. Bayern captain Mark van Bommel conceded Inter was the “most effective team”, referring to the success of Inter’s counter-attacking tactics. José Mourinho revealed after the match that he would likely resign from Inter to pursue the goal of being the first manager to win the Champions League with three clubs. Reports had linked him with a move to Real Madrid. 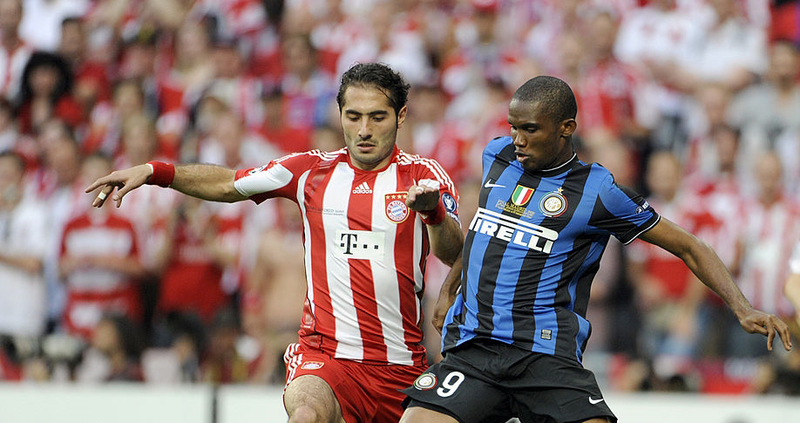 As the winners, Inter played against 2009–10 UEFA Europa League winners Atlético Madrid in the 2010 UEFA Super Cup, and also entered the semi-finals of the 2010 FIFA Club World Cup.